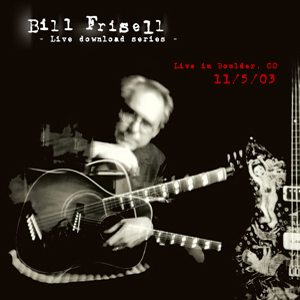 Amidst all the Americana music, Frisell has made clear that his folkloric interests extend far beyond the lower 48 states. His aptly named The Intercontinentals (Nonesuch, 2003) brings together musicians from around the globeâ€”with friends Scheinman and Liesz joined by Malian percussionist Sidiki Camara, Brazilian guitarist/multi-instrumentalist Vinicius CantuÃ¡ria, and Greek Macedonian oudist Christos Govetas. Live Download Series #006 is one of the few shows in the series taken from a tour in specific support of a record, with the identical personnel. It's also a rarity in that most of the set list is actually culled from the album, with 11 of The Intercontinentals' 14 tracks represented in this two-disc, 15-song, two-hour download, though in every case but the relatively structured miniature, "The Young Monk," the sextet stretches the material beyond the studio versions' confines.